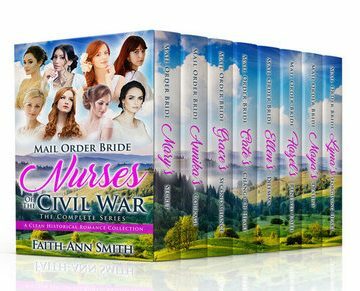 Amazon bestselling author Faith-Ann Smith’s Mail Order Bride: Nurses Of The Civil War, The Complete Series follows the struggles and triumphs of eight volunteer nurses seeking a new lease on life after caring for our country’s wounded war heroes. Will their hearts find the happily ever afters they’ve been longing for? Forced by her uncle to get engaged to a man she doesn’t love, Mary is forced to concoct an entirely different persona for herself through her letters to Caleb Knight. But how long can Mary keep up her pretenses before the truth finds its way to the surface? Annika’s father takes it upon himself to ensure that a young man, who plans on heading West, finds his way into his daughter’s New England heart after the war comes to an end. But does father always know best, or will Annika’s own hopes and dreams for her future thwart his plan? When young Grace Williams decides to courageously volunteer as a Civil War nurse in the City Point tent hospitals, little does she realize that treating her most obstinate patient yet will prove to be rewarding in more ways than she could ever imagine. But one morning, when Grace finds the Major has been suddenly discharged from the hospital without her knowing, Grace is left heartbroken. Will her heart ever reunite with the Major’s, or will their blossoming relationship be left on the war fields forever? Cate selflessly comes to a bandit’s aid and slowly nurses him back to health in the wilderness, but will Cate ever make it to the altar in Nebraska? Or does God have another plan in store for her? Engaged to the vile Gage Soren due to the wishes of her father, Hazel soon finds out he is really planning on selling her overseas. She bravely makes her way via ship to San Francisco to seek out her beloved Noah, but upon her arrival, something is amiss. Can she trust her feelings for this man, or is this yet another trap? And is Gage hot on her trail? When Maya arrives in California, she finds that the man she has been set up with is none other than James Hawke, a boy she had fallen for when she was a teen, but had broken her heart so many years ago when he left unannounced. Will fate give these two a second chance at love? Or will James’ troubled past keep Maya from being able to fall for him once again?